Remember at the beginning of the course we said that most randomized algorithms are either simpler or faster than the deterministic version (or both). In the last unit on data structures, we saw some randomized solutions that had the same asymptotic speed as things like AVL trees and red-black trees, but which are much simpler to program. This unit is about the other end. We will look at two important algorithms for which the randomized solution is faster than any deterministic algorithm. These algorithms are not necessarily going to be simple, but they do give an improvement over the worst-case deterministic cost. They demonstrate that randomness actually has some "power" to it; it isn't just a tool to let us be lazy programmers. The outcome is either win or lose. Whenever one player wins, the other one loses. Some adjectives you might see to describe this kind of game are perfect-knowledge, zero-sum, sequential, discrete, and non-stochastic. You don't have to worry too much about these terms (they come from game theory); just make sure your game follows the rules listed above and it will work for what we're doing here. Each node in the graph represents a partial configuration of the game. In board games like tic-tac-toe or checkers, a partial configuration is just a game board with an arrangement of pieces or marks on it. The root node of the graph is the starting configuration. In tic-tac-toe, this is just an empty 3 by 3 grid. Every edge (a.k.a. branch or connection) in the tree represents a single player's move on their turn. In tic-tac-toe, each edge corresponds to one player putting their X or their O in one position of the grid. Each leaf node is a "terminal configuration", meaning that no further moves are possible. Each leaf node represents a win or a loss, which can be explicitly determined. That's important, so I wrote it in bold. See? In class we drew some examples of game trees. The internet has many more, so I'm not going to draw one out here. So far we know that each leaf node is classified as either a win or a loss. But what about the other nodes? What's the point? We're going to use game trees to determine whether a game is always winnable by some player. That is, is there a strategy of moves that the player can employ to guarantee themselves a win, every time? Evaluating a game tree gives us this answer! For what follows, I'm going to use the first person ("I", "me") to talk about the player whose winning strategy we're trying to determine. The way it works is, the non-leaf nodes in the tree (a.k.a. "internal nodes") are classified as OR nodes or AND nodes. An OR node is evaluated as a win if and only if at least one of its child nodes evaluates to a win. This corresponds of course to the boolean "or" operator, and in terms of a game it means a move that I make, where I can choose which move it is. If there is at least one move I can make that still guarantees me a win, then I can always win - simple as that! An AND node is evaluated as a win if and only if every one of its child nodes evaluates to a win. In the game, this corresponds to the other player's turn: if I can guarantee a win no matter what move the other player makes, then I can always guarantee a win. Putting this together, evaluating a game tree just means working up from the leaves to the root, computing ANDs and ORs of the nodes, until we get to the root. The nodes on each level of the tree will alternate between AND and OR nodes, since we are talking about 2-player games where the players alternate taking turns. If the root node is OR, then "I" am going first, otherwise I am going second. If the result at the root is "win", then there is a winning strategy that will guarantee I can never lose! About ties: Most of the 2-person games we are talking about are not really win-loss games; there can also be ties. But our definition of game trees doesn't allow for that. u.leaf is true or false depending on whether this node has no children. u.win, for a leaf node, is true or false depending on whether this configuration represents a "win" or "lose" outcome. u.children, for a non-leaf node, iterates through each child in left-to-right order. This algorithm works fine, but it is rather slow. No matter what, it does recursive work at every single node in the tree. 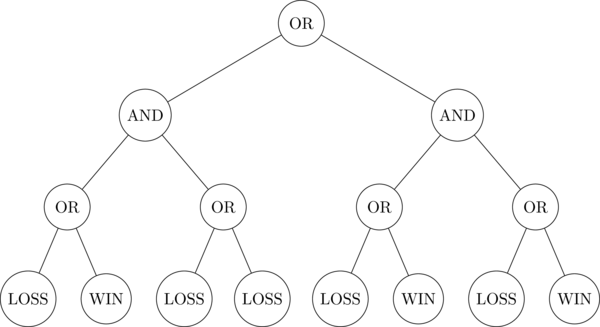 For a game tree with \(n\) nodes total, the cost of this algorithm is \(O(n)\). You can confirm that the algorithm above is "forced" to evaluate every single node in this tree, recursively. The overall output is "true" (a WIN is always possible for the first player), but \(O(n)\) work must be done to obtain this answer. In fact, it is not too difficult to see that any deterministic algorithm could be forced to do this much work in the worst case. The way the proof works is like this: take any deterministic algorithm, and imagine an "adversary" that will construct the worst-case for that algorithm. The worst-case will look just like the example above, except that it is constructed dynamically by the "adversary", as the algorithm asks questions about whether each leaf is a win or a loss. We saw an example of this in class. In other words, no matter how clever we make a deterministic algorithm with tricks like the "short circuiting" above, their cost will always be \(O(n)\) in the worst case. The short-circuiting doesn't really help. Importantly, this random order is the "sampling without replacement kind" - otherwise we might keep picking and re-evaluating the same child over and over again! This randomization is straightforward enough, but will it really help? Certainly the worst-case will still be \(O(n)\) nodes evaluated. In fact, this seems inevitable at first. If the root of the tree is "OR" and the game is not winnable, then every child will have to be evaluated recursively in the inner for loop, no matter what the order is! Similarly if the root is "AND" and the game is winnable; every child gets recursively evaluated, no matter what the order. The trick to this analysis is looking down two levels into the recursion. Consider the unlucky case described above: the root node operation is "OR" and the ultimate return value is False. Then every subtree of the root must be recursively evaluated. In fact, we know more than this: each of these subtrees will be an "AND" node that evaluates to False. And this means that, while the top-level "OR" node is not short-circuitable, each of its subtrees is short-circuitable. The opposite is true when the root node is "AND" - either this node is short-circuitable, or all of its subtrees are. Now we are ready to start writing down some recurrences to do the analysis. For this analysis, we will assume the branching factor is \(k=2\); that is, every node has exactly two children. You will consider other branching factors in the problems. This is because, when the tree is not short-circuitable, the randomized algorithm always requires both recursive calls, but those subtrees will both be short-circuitable. Therefore our randomized algorithm is a significant improvement over the deterministic \(O(n)\) algorithm. But it's even more important than that, because we proved that any deterministic algorithm for game tree evaluation will have worst-case cost \(O(n)\). So this problem is similar to the "airplane terrorists" scenario in that it really shows the power of randomization to do something faster than would be possible without it. Imagine you run a telecommunications company and are trying to run a new high-speed fiber optic cable to a number of locations in the area. You want to connect all of them using the least amount of cabling possible, or at the lowest cost, whatever. We don't care how the locations get connected, just that they are all connected. This problem can be modeled using a graph: The nodes of the graph are the locations, and the edges between nodes have the cost of laying fiber optic cable between those two locations. And now the telecommunications company's predicament is asking for a collection of edges (connections) in this graph that connects all the nodes, and has the least possible weight. This is called a minimum spanning tree or MST. You learned about some MST algorithms in IC 312 (Data Structures). These might have included Kruskal's algorithm or Prim's algorithm, or possibly Boruvka's algorithm. These algorithms are all interesting and worth understanding, and (importantly) they all cost \(O((n+m)\log n)\) time in the worst case to find a minimum spanning tree of a graph with \(n\) nodes and \(v\) edges. Some edges might get added to T more than once, but T only has one copy of any given edge. The edge "contraction" on the second to last step combines nodes joined by any edge in T into a single node, but without removing any edges. So the resulting graph might have "multiple edges" (more than one edge between the same pair of nodes) or "loops" (an edge going from a node back to itself). The returned set T contains some, but not all, of the edges in the MST of G. However, any MST of the contracted graph, plus the edges in T, will form an MST of G.
How fast is a single Boruvka step? For each node, it has to go through all that node's edges once, to find the shortest edge attached to that node. Since every edge is adjacent to 2 nodes, a given edge is looked at at most twice in this process. So the total cost for finding all the edges for T is \(O(m+n)\). And in fact that's the cost of the whole thing: linear-time in the size of the graph. To use Boruvka's algorithm to compute an entire MST requires multiple Boruvka steps, of course. How many? Well, each Boruvka step will reduce the number of nodes by at least a factor of 2. That is, the resulting contracted graph will have at most \(n/2\) nodes. This is because the for loop adds edges to T \(n\) times, and each edge can only be added two times, since it has only two endpoints. Contracting each edge reduces the number of nodes by one, so contracting \(n/2\) edges reduces the number of nodes to \(n/2\). This means that, in order to compute the entire MST, you must do enough Boruvka steps until the number of nodes equals 1, which would be \(\log n\) steps. Hence the worst-case cost of Boruvka's algorithm is the same as the others, \(O((m+n)\log n)\). Imagine being given a tree in a graph, that someone claims is the MST of that graph. How could you check whether they are telling the truth? This is known as the MST verification problem, and it turns out to be important in computing the MST itself! Fact: If \(T\) is an MST of \(G\), then for every edge \((u,v)\) in \(G\) that is not in \(T\), adding \((u,v)\) to \(T\) creates a cycle, and \((u,v)\) the the highest-weight edge in that cycle. An edge in \(G\) is T-heavy if adding it to \(T\) creates a cycle, and that edge has the largest weight along the cycle. Otherwise - if adding the edge doesn't create a cycle, or if it doesn't have the largest weight along that cycle - the edge is T-light. Any T-heavy edge can't possibly be part of any MST of \(G\). Essentially, the tree \(T\) proves that these T-heavy edges are not part of the MST. This means that \(T\) is an MST if and only if every edge of \(G\) that is not in \(T\) is T-heavy. Hence, the verification succeeds if and only if the T-light edges are just the edges that are in \(T\) itself. The important thing is that linear-time MST verification algorithms exist (we won't go into the full details though), and these algorithms will actually spit out a list of T-heavy and T-light edges. This is really useful, because even if \(T\) itself is not an MST of \(G\), we know for sure that the MST contains only T-light edges from \(G\). Given a candidate MST, this verification algorithm can spit out a (hopefully) small subset of edges from \(G\) to recursively search for the true MST. Run a Boruvka step on \(G\) to shrink it down. Run a second Boruvka phase on the result from step (1). Construct a random subgraph \(H\) of \(G'\), by randomly choosing each edge of \(G'\) to be in \(H\) with probability \(1/2\). Recursively call this MST algorithm on \(H\), returning \(F\), the minimum spanning forest of \(H\). Use a MST verification algorithm on \(F\) to compute all the \(F\)-light edges in the original \(G'\) from step (3). Construct a new graph \(G''\) which consists of the F-light edges from \(G'\). Recursively call this MST algorithm on \(G''\), returning \(T\) which is the MSF of \(G''\). Return \(T\). It's the MSF of \(G\) as well! \(H\) has at most \(n/8\) nodes and an expected number of \(m/2\) edges. \(G''\) has at most \(n/8\) nodes and an expected number of at most \(n/4\) edges. which solves to \(T(s) \in O(s)\). Therefore the total worst-case cost of this randomized MST algorithm, in expectation, is \(O(m+n)\), linear-time in the size of the input. AMAZING! WORLD CHANGING! To this day, the only linear-time MST algorithm is this way, using randomization. Again, the power of random numbers is revealed. Observe that, in this case, the randomized algorithm is not simpler than the deterministic version, but it is "better" in the sense of asymptotic running time. This is different than the randomized algorithms and data structures we have seen before.